“Don’t you think you always write about sophisticated dishes instead of day to day food that are popular in Bengali Households?” asked Sourya Da! Do you have the recipe of Aloo Posto, Kalai er Daal or Kacha Aamer Ambol on your blog? After three years of food blogging and around 100 posts (which is quite low as compared to the time I am writing) now I am confused about the typicality of my blog. Actually, this is what one of my university senior Dr Sourya Das was asking a few days back! “Debjani What’s your speciality?”. ”Mine is neither a specialised Bengali cooking blog nor a typical Baking blog; Debjanir Rannaghar is a hotchpotch blog with no speciality at all and this is what I always wanted for. I am not a culinary degree holder neither a great writer but want to record all my attempts. I also love to share my food stories in the form of a blog”. However, Sourya da was not at all convinced with my depiction! “How come Debjanir Rannaghar” is not a Bengali food blog while you have 33 out of 97 recipes are from Bengali cuisine?” However, after around 30 minutes of chitchat, he finally convinced with my answer “Debjanir Rannaghar is not a Bengali cooking blog but by a hard-core Bengali and hence the heart of Debjanir Rannaghar is nothing but Bengali!” And from this point, he again started further analysis! On this note here I am with a portion of my Saturday Lunch Kacha Aamer Ambol or Amer Tawk. I always prefer to cook hassle-free Bengali comfort food as part of our Saturday lunch and today is not an exception. I’ve prepared Kalai er Daal, Bori Aloo Posto, Postor Bora and summer special Kacha Aamer Ambol “ aka Kacha Aamer Tawk (a runny Raw Mango soup) for lunch. Yes, you reed it write! Amer Ambol is not Chutney but a runny sour soup that we serve at the end of a meal! 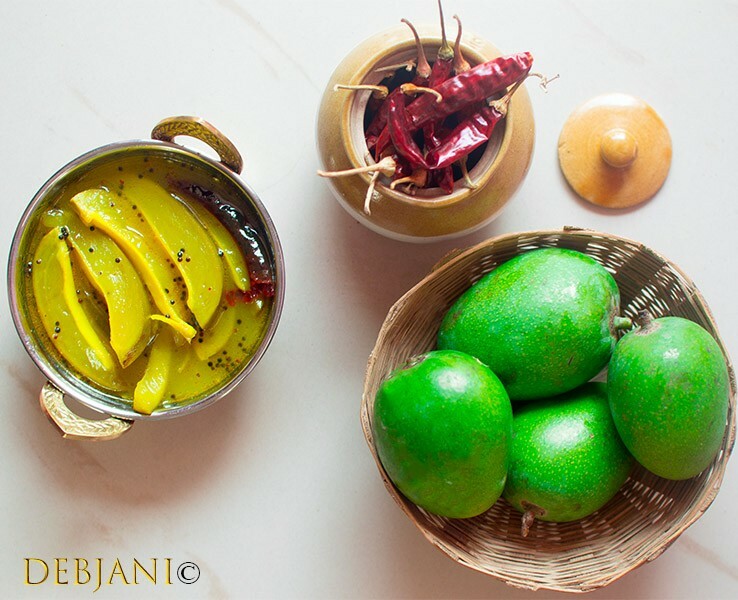 A typical full course Bengali lunch is incomplete without chutney or Ambol or Tawk in Bengali. We love to end the meal on a sweet and sour note and either Chutney or Ambol or Tawk do the thing for us. The word Ambol came from “Amlaw” which means sour. In other words, Ambol stands for acidity as well. Mostly tempered with Mustard seed Tawk/ Ambol is prepared either with Raw Mango or Aamra or with Raw Tamarind. Ambol is not as rich as Chutney instead it is like a runny sour soup that we prefer to have after completion of the meal. 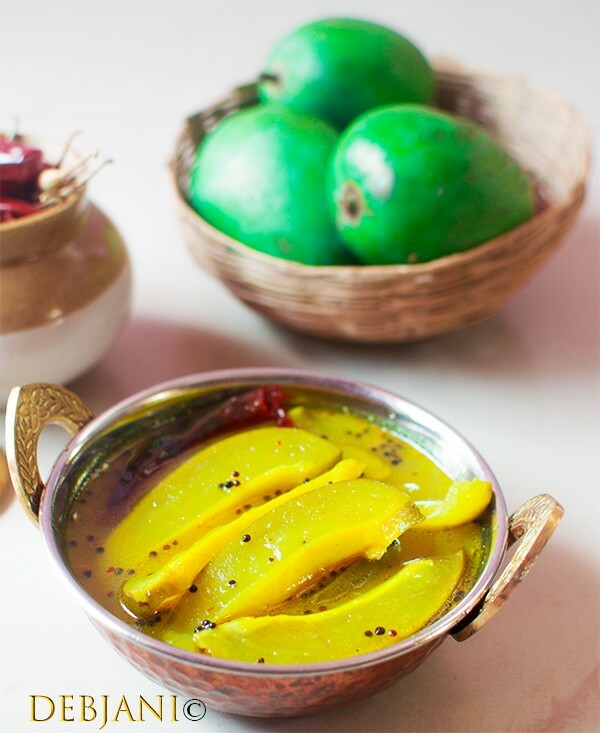 Recipe of Kacha Aamer Ambol or Aamer Tawk is almost similar in every Bengali household however, some people including my Maa and me prefer to cook the Mango along with the skin as it provides the Ambol with a unique flavour. Kacha Aamer Ambol | Runny Mango Soup! 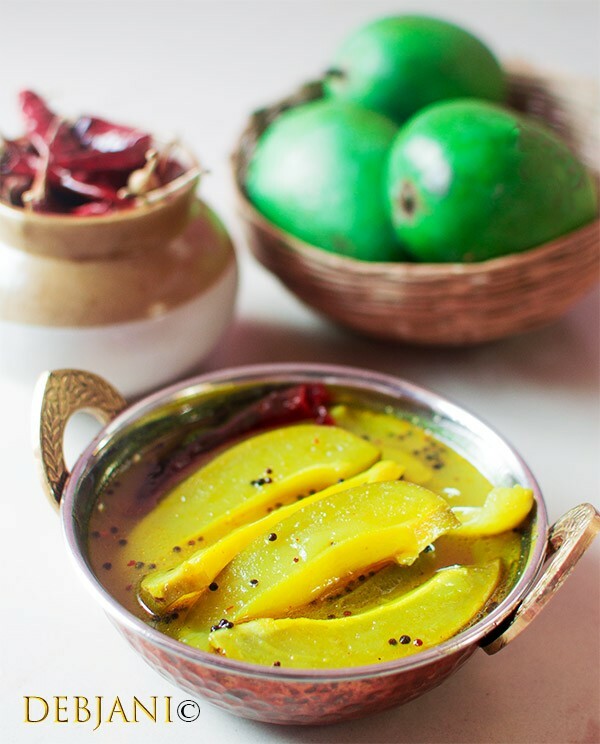 Kacha Aamer Ambol aka Amer Tawk is a Bengali style Raw Mango Soup and is a summer delicacy. Black Mustard Seed: 1 Tsp. Wash and cut Mangoes into long strips. I prefer to retain the skin of the Mango. You can also remove the skin of the mangoes before chopping. Take Oil in a Wok and heat sufficiently and temper the oil with dry Red Chilli and Black Mustard Seeds. Adding Dry Red Chilli is optional, however, I prefer to temper the oil with a chilli for its aroma as well as for spicy taste. Now add Mango pieces and cook for 2-3 minutes in low flame. Add Salt, Sugar and Turmeric Powder and mix properly. 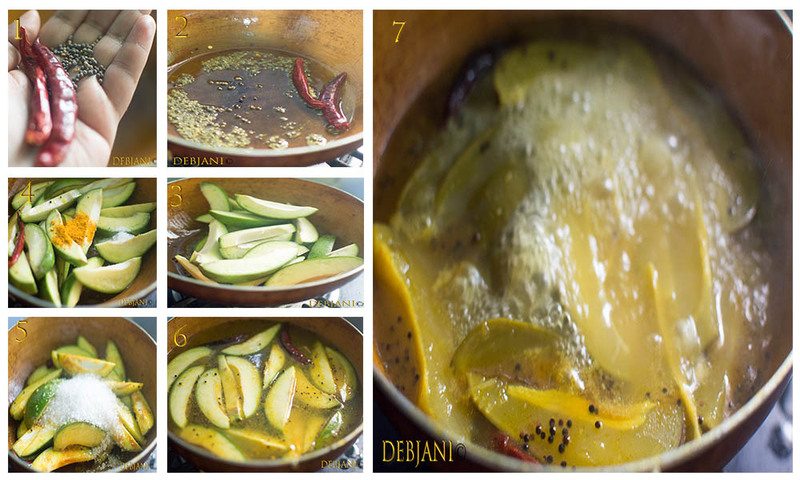 Add Water to cover Mangoes and then cook in low flame for around 10 minutes or till Mangoes soften. Ambol should have sufficient water in it. Now take the Ambol out in a bowl and refrigerate before serving. We generally serve Amer Tawk aka Kacha Aamer Ambol at the end of the meal. Increase or decrease the sugar based on how sweet or sour is the mango. Use of Dry Red Chilli is optional, however, it gives the required punch to Amer Tawk. Instead of Mustard Oil, you can use Vegetable oil, however, mustard oil gives the required pungency to the dish. Ideally, Aamer Tawn is a runny soup however, you may thicken the same. 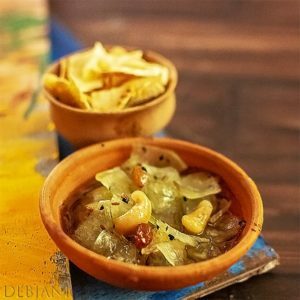 Have you tried the Kacha Aamer Ambol Recipe from Debjanir Rannachar! ** The post is updated with Pictures and content in 2018.